Wi-Fi has certainly made life easier for Road Warriors. While you can find Wi-Fi in many places, some hotels still provide in-room internet access via a wired Ethernet connection. The same holds true in many offices and conference rooms. A wired connection is fine if you’re traveling with a conventional notebook that has an Ethernet port. But many travelers are ditching notebooks for iPads, iPhones, Android tablets, and smart phones - none of which have wired network ports. Even some of the new ultra thin notebooks like the latest iteration of MacBook Air have shed the built-in Ethernet port. Unless you have a cellular data plan, you need a Wi-Fi connection. The D-Link DIR-505 SharePort Mobile Companion (AKA All-in-One Mobile Companion) aims to solvethis connectivity problem for you. 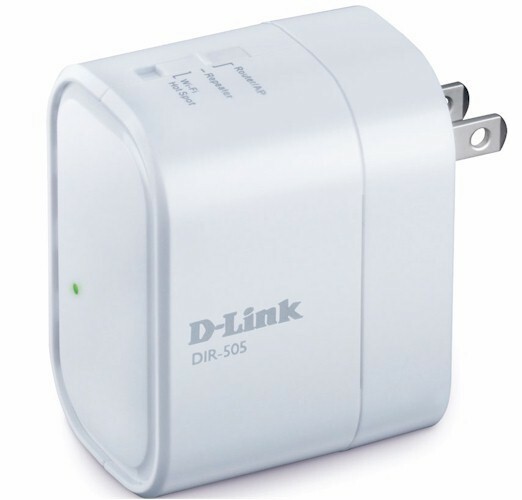 At its core, the DIR-505 is a portable wireless router/AP in a convenient “wall wart” form factor. Though it’s quite similar to the recently-reviewed TP-Link TL-WR700N, the DIR-505 has a few additional features that may make it worth its premium price. The DIR-505 comes in a small 2.77” x 2.60” x 1.69” (7.036 x 6.60 x 4.29 cm) convenient form factor designed for the traveler. Unlike some of the compact travel routers I used to travel with, the built-in power plug ensures that you’ll never forget to bring its power supply. The power plug is offset, so you won’t consume more than one outlet. You’ll find all of the connections on the bottom of the device shown in Figure 1. The bottom of the device has a USB 2.0 port, a “pin” reset button, and a single10/100 Mbps Ethernet port that you can connect either to your Cable/DSL modem (in router mode) or to your local network if you’re using the Access Point mode. You can attach USB storage (Flash drive or external disk) to share files with others on your network via SharePort, or you can use the USB port to charge your phone if you have an appropriate cable. A Wi-Fi protected setup button (WPS) is another of the features that distinguishes the D-Link product from its TP-Link competitor. WPS allows you to easily connect to other devices that also support WPS. With information found starting on page 146 (of the 200 page user guide), I successfully connected my Windows 7 computer using the WPS push button method. I just pressed the WPS button on the side of the DIR-505 (the side opposite from the DLink logo in the first image above) when Windows 7 prompted me for the network security key. The DIR-505 also supports WPS using a PIN number found in the device’s security menu. WPS is a requirement for Wi-Fi Certification and the packaging for the DIR-505 indicates that it has been certified. As Tim pointed out in his review, the TP-Link product, lacking WPS, is not Wi-Fi Certified. On the top of the device, shown in the first image above, you’ll find a three-position mode switch. The factory default is Router/AP, and is most likely the one that you’ll use. In this mode, you can configure the device to be a traditional router to route traffic from the internet (or the hotel’s network) to your own private subnet (default is 192.168.0.0) or to be an access point to bridge from your existing wired network to provide wireless access. To change between modes, you have to log into the device and change the configuration from within the management UI. The Repeater mode allows you to connect to another wireless network and boost the signal for your wireless clients. In the Wi-Fi Hot Spot mode, you can use Wi-Fi to wirelessly connect to another network, and then route that network to your own IP subnet. This mode can provide added wireless security as well as allow clients attached to the device to share files securely. This would be useful if, for example, you were holding a small group meeting in a location that only had Wi-Fi access. I only had a single sample, and I didn’t want to risk damaging it by tearing it apart to take photos. However, Figure 2, taken from the photos submitted by D-Link for FCC certification, shows that the device is based on an Atheros AR1311 SoC. While there is no information to be found about the device, it appears to be a single-stream (1X1) 802.11bgn multi-function wireless router/AP/bridge. The Nanya device also visible in the photo provides 64 MB of RAM. The flash device on the other side of the board wasn't clear enough to pull a part number from. Once you connect to the DIR-505, you are instructed to go to http://dlinkrouter. Actually, if you type in any URL such as http://www.smallnetbuilder.com, the DIR-505 intercepts your request and takes you to a first run wizard shown in Figure 3. The wizard guides you through choosing the operating mode (router or AP), configuring the internet connection, setting Wi-Fi security, router password, and time zone. I like the fact that the DIR-505 comes pre-configured with wireless security enabled, and that the wizard prompts you to enter an admin password. You can also enable graphical authentication in addition to using a password. All-in-all, the wizard ensures a secure setup. Once you complete the wizard, you should be connected to the internet. You’ll only need to log into the UI to change some of the more advanced features such as port forwarding, DDNS (Dynamic DNS), setting up a guest network, or to configure the DIR-505 for sharing attached USB storage. You’ll also have to log into the device to change it between router and AP modes. Tip: The documentation is a little out of sync with the current firmware version. You’ll find the router/AP selection box on the Manual Internet Connection Setup page, not on the Manual wireless connection setup page shown in the user guide. If you’ve ever logged into a recent D-Link router, the DIR-505 user interface will feel very familiar. Figure 4 shows the landing page for All-in-One Mobile Companion.